The Etienne Opal Cloisonne Urn. This work of art is hand-crafted using an intricate and ancient metalworking process with multiple layers of fired enamel over copper or brass. Because each urn is hand-made, the design and color will vary a bit from urn to urn, making every urn an individual work of art. This urn loads easily through the top which is secured with a threaded lid. As with all urns, cremains should be kept in a sealed plastic bag inside the urn. Also available: The matching keepsake and Heart Keepsake. See Related Products Below. 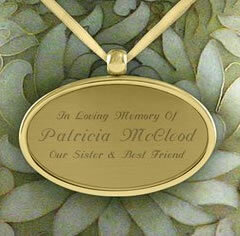 Engraving: An engraved pendant is available. (See Photo). Please limit engraving to no more than 30 spaces per line. Please allow 1-2 business days for engraving before item ships. URN SIZE: Standard Adult Urn measures 11"(H) x 7"(W) and holds 200 cubic inches. Nonengraved items usually ship one business day after order is placed. Ships from the Midwest.